It occurred to me that I haven't posted what is arguably one of the tastiest pizzas from the Twi-tini Party I hosted a couple of months ago. Mr. swatchcat loooooves this pizza. And who wouldn't? It has chicken, barbecue sauce, cheese...yep, that covers all the food groups except chocolate! Prepare refrigerated crust as instructed. Cube the chicken breasts into approximately 1/2" cubes, and in a skillet, sauté with 2 tbsp. Canola Oil and the chopped garlic, until thoroughly cooked. Set aside in a small dish. Cut the onion so that they are in 1/2 rings, and cut the larger pieces in to smaller strips, if desired. In the same skillet as the chicken was prepared, heat the oil over high heat, and when the oil begins to ripple, add the onions and stir. Add a pinch of salt and continue to stir the onions. It's okay if they stick to the bottom, just scrape them up and keep stirring until the onions reach the darkness and texture desired. I prefer mine a deep golden brown and on the softer side. 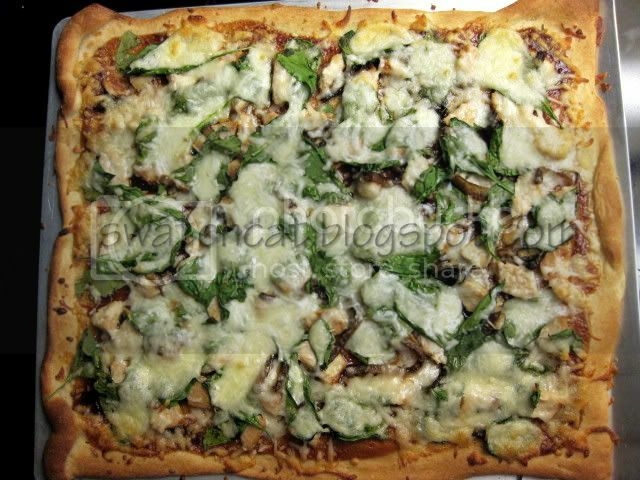 Now that the toppings are prepared, spread the barbecue sauce over the pizza crust, then top with the cubed chicken, caramelized onions, baby spinach (make sure it's washed! ), and finally the shredded mozzarella. Bake for approximately 8 minutes, then coax the pizza off the baking sheet directly onto the rack, and finish baking until the crust is a golden brown, and the cheese is melted and starting to brown. Total baking time should be between 12 and 14 minutes. Let it cool for 5 minutes, slice and enjoy! If you are averse to veggies, this pizza is just as tasty sans onions and spinach. But I like adding them veggies just to keep it on the healthy side.